Here at Thunderbolt Digital, we’re celebrating pancake day with enthusiasm. We were all slightly curious here in the office as to why we have pancake day which as you know is also known as Shrove Tuesday. There is quite an interesting history so we thought we’d share it with you although if that’s not your thing don’t worry we’ve got some fun topping idea’s to make your perfect pancake. Shrove Tuesday is the traditional feast day that occurs the day before Lent on Ash Wednesday – the 40 days of fasting leading up to Easter. On Shrove Tuesday Anglo-Saxon Christians would attend confession to be absolved of their sins. On this day a bell would be rung to call people to confession and this would be later known as the ‘pancake bell’. Pancake day always falls 47 days before Easter Sunday so the date varies on a yearly basis from February 3rd to March 9th. Pancake day was the last opportunity to use up eggs and any fats before the 40 days fast began. Pancakes can be seen to symbolise four points of significance at this time of year and recipes date back as far as 1439. 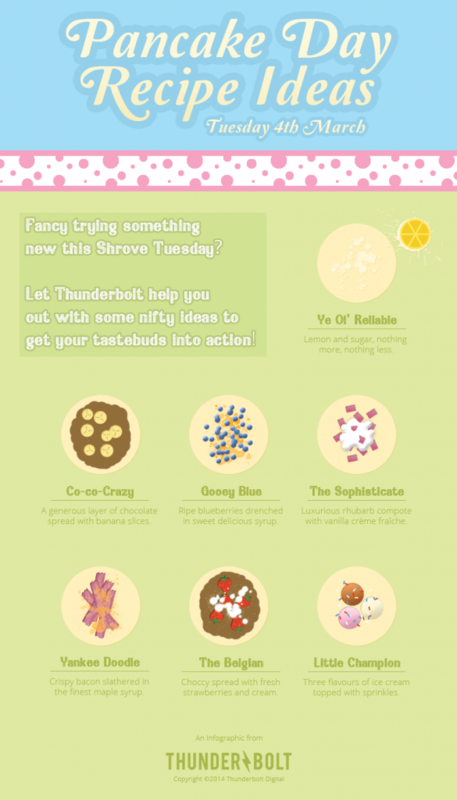 Now it’s time for the fun bit, below we’ve created a rather fun graphic picture with 7 fun topping ideas for your pancakes, these are some of our personal favourites and we hope you enjoy them as thoroughly as we do. Thunderbolt Digital is a full-service digital marketing agency based in Farnham Surrey. We’re wishing you a brilliant pancake day from the office. If you have any questions regarding our services then don’t hesitate to contact us on 01252 413 757 or at howdy@wearethunderbolt.com. Also, don’t forget to check out our Instagram @thunderboltdigital to see what we get up to during our everyday office times!